We have spent most of the week inside due to all the rain it was so nice to get outside to enjoy the garden today. Adelynn loves being outside. As you can imagine all that rain has put her in a bit of withdrawal. I totally get it because I too had been wanting to be in the garden. We love the garden. A week away has made for much to do around the garden. The weeds for example have been very busy growing and getting into things. Naughty weeds. I'll get to them later this weekend. I noticed them getting sassy in the vegetable patch and I got my eye on them. They won't fool me. You see the weeds are not on my mind at the moment. They should be but instead I have a bigger problem to address. There were some huge storms that passed through our area this week causing flooding all over the place. Sinkholes, downed trees, even roads were washed out. We too had our own share of damage. Taking advantage of the break in our stormy week it was time to get outside. While I took stock of our garden Adelynn wandered around chasing the cat. She and Lincoln ran around chasing butterflies. It was hilarious. All those big storms caused a lot of mess for me to clean up. We lost all of our mulch and a good amount of topsoil when the flood water raced downhill washing across our back yard. Unfortunately our vegetable gardens lie in that washout zone. We haven't had a big washout for a few years. Keith has spent a good deal of time working on ways to divert any water from our garden areas. Up until this week his design held up. Nevertheless we press on, clean up, and reevaluate our garden flood prevention. I spent the morning searching for mulch and raking what remains of our mulch. It must have been quite a stream of water that passed through our yard which is to say there was hardly any mulch to be found. Most of the mulch must have been washed into the woods. There it will remain. Since the mulch clean up was not as involved as I expected it to be I took the time to harvest all the lettuce and spinach. They are on the verge of bolting so it's now or never. The best part about a good hard rain is that all those no good trouble making bugs that normally would be found terrorizing my greens were washed off the plants. It makes the sink washing process so much easier. It took me over an hour to collect all those greens. Between checking in on Adelynn and breaking up kitty shenanigans I was pretty distracted. Blissful though. Listening to the birds, I kept an eye on those little clouds with rumbles of thunder passing by and I looked toward the sunny skies. Being outside was wonderful. It was peaceful to be surrounded by the garden. When I was done harvesting the lettuce and spinach I moved on to next vegetable. Our spring onions are going strong so I selected a few that were ready to be picked. Into my harvest basket on top of the spinach and lettuce they went. Adelynn made her way over to me looking in my basket at all the lettuce. She picked up a leaf and inspected it gently dropping it back into the pile. I placed the full basket next to the pea patch. Her eyes were drawn up to the peas tangled around the teepee poles. She saw numerous pea pods dangling there and looked at me. Pointing to some plump pods she said "more" reaching out a hand to touch the sun warmed green pods. I plucked a pea pod off the plant and began to pop it open. Eagerly she grabbed the opened pod. She has been watching her big sisters devour peas all week. She knew what to do with that pod and was so pleased with herself for knowing how to eat them. 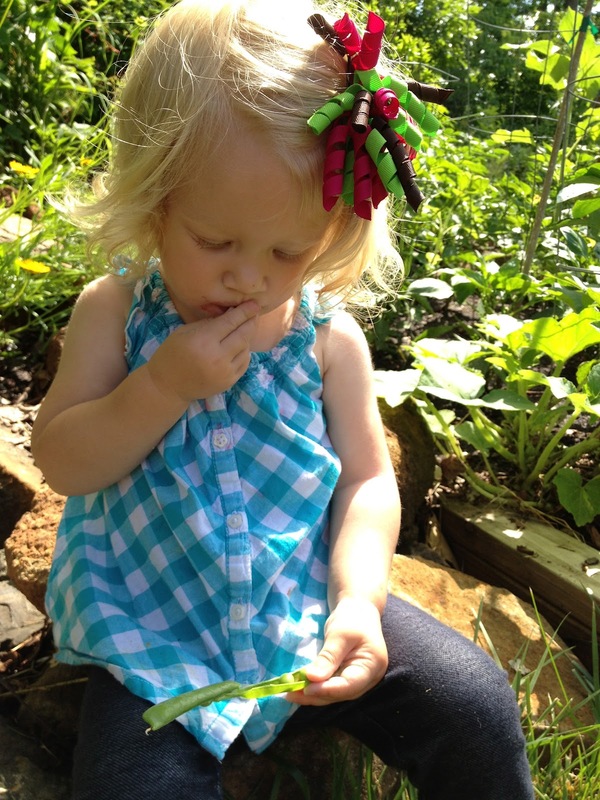 Her tiny fingers began to delicately pick a pea out of the pod and then place it in her mouth. After concluding that the pea was indeed sweet and delicious she began to stuff more into her mouth. Moments later the pod in her hands was empty. She requested another pod. I handed her another opened pod bursting with perfectly round sweet peas. Realizing that she needed to invest a little bit of time in this snack she decided to find herself a spot to sit and enjoy those peas. A small grouping of rocks next to the apple tree is where she decided to sit. 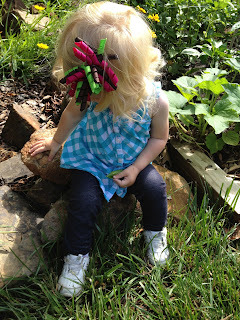 I kept plucking peas off the plants and in between that I'd open a pod for her to take back to her rocks. She would occasionally sit next to me offering every other pea from her pod. Such a delightful garden memory. Seeing her sit there on those rocks munching away on peas was amazing. Here we were having a good morning enjoying the bounty of our hard work. I tending the garden as she played. It was reaffirming that there is simple goodness in working the dirt. Growing your own food and seeing it on your table even if that table happens to be a pile of rocks under an apple tree. If you ask me that is a rather delightful table location. As she and I enjoyed our peas I thought about what our little garden will produce this year. It will be a wonderful journey to see what delicious produce will grace our table. About 6 pods later Adelynn had her fill and was off to drag her "buckie" (her blue bucket) off to another adventure. She moved around the yard collecting various things to put in that bucket. Sticks, rocks, chalk, a pea pod just because, and shovel. With my pea bucket full it was time to move on to the next thing to harvest. Our strawberry patch is on the end of its season. We have had a bountiful amount of berries this season. Today looking through the patch I realized that I needed to pluck those berries days ago. Some were just over ripe and wasting away. Oh the sadness to see a beautiful strawberry going bad. I filled up a small bowl with the juicy berries and set them on the ground. Adelynn had toddled up next to me and babbled gesturing towards the berry patch. I had a strawberry in my hand and she looked at it as I was inspecting it for damage. She pointed at it and said "Mmmm" then babbled some more which I took to be her asking for a bite. Taking a step toward me her foot kicked the bowl and she saw a big treat waiting just for her. Picking up the bowl she giggled and squealed. Before I could stop her she put a small strawberry into her mouth. Moments later with a look of disgust on her face she spit out the leaves. I didn't have time to remove those leaves before she ate the berry. It was very adorable to see her eagerness. 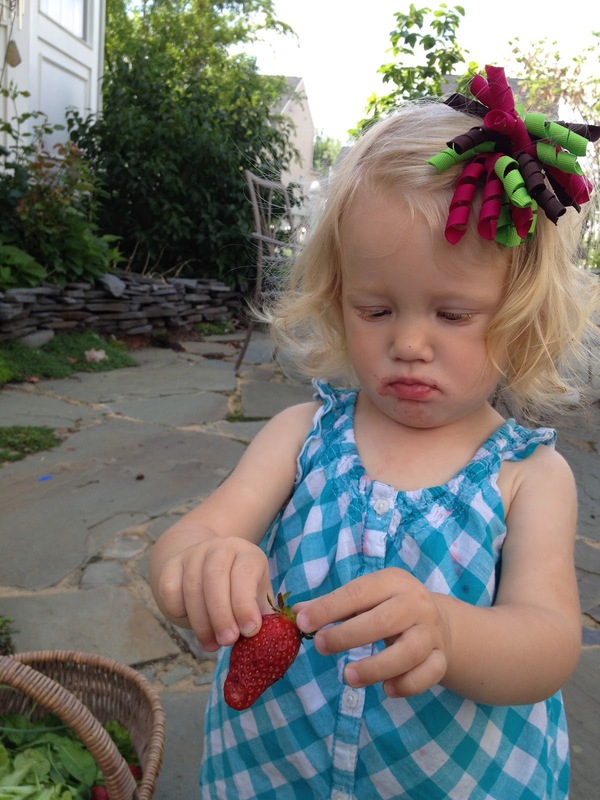 Her second berry was almost the same result. I sat down and showed her how to pluck off the leaves. With that bit of knowledge she began to enjoy her strawberries. Half of the berries I collected ended up in her belly. She'd take a bite out of each one delicately placing them back into her bowl. Her face stained pink with strawberry juice she offered me countless grins. Juice running down her chin staining her shirt she was full of blissful enjoyment. 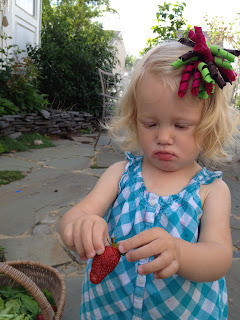 I loved watching every minute of her happy strawberry chattering. By nap time she was ready to sleep. Snuggling up with me in the rocking chair her little blue eyes looking up at me she talked to me in her toddler babble. I could see her eyes getting heavy with sleep. Slowly her talking stopped and she was falling asleep. We rocked some more and I watched her. She smelled of strawberries and dirt. Her blond curls covered her ears falling down along her neck. I could see traces of strawberry juice on her neck where I missed cleaning her off after lunch. She was perfectly happy perfectly peaceful. Yes. I do think this is a day worth remembering.